Check out our handy guide to renting out ACs this summertime. Bookmark it, and cool off. Maruti ACs is based out of Aaram Nagar, however, they rent out ACs from Bandra to Goregaon. They provide window ACs, though one needs to confirm the AC first. They have an additional charge for installation (INR 300) plus any carpentry charges for setting up the frame if it’s not already there. Delivery is free in Andheri, however, beyond Andheri there will be transportation charges. Delta Cool is based out of Powai, and they tell us they only rent out in and around Powai and Andheri East. Beyond that, they unfortunately, don’t venture into. They provide secondhand window ACs, along with split ACs as well. The minimum duration for the rent is at least six months, and during those six months, any repairing issues will be on the company under warranty. They charge extra for installation (INR 800 which includes transportation). If the framing hasn’t been done, work done by the carpenter is chargeable. Ambassador AC Rental is based out of Grant road and they provide AC on rent in Mumbai – for their ACs as well as coolers. They will send a person to your place first to check the size of the window, and if there’s any additional work that needs to be done. They charge for installation as well as transportation charges. However, during the renting period, if there’s something wrong, they will send a person but it won’t be free of cost. #LBBTip: You can also rent out coolers here. Price: INR 1,500 per month on a yearly basis; For three months it is INR 2,000 per month and INR 1,800 per month for six months. Cool Point is in Malad, though they will offer their services across Mumbai. Just call them up in advance to set up the timings and day for the fittings, as they generally take at least two-three days for the set-up. They also take a deposit of INR 5,000 which is fully refundable post the renting period. Any cost when it comes maintenance during the renting period is completely on them. Transportation may be between INR 400 to INR 450 (one way). Price: INR 800 per month for six months; INR 1,000 per month for three months. One of the most reliable ones in Andheri West, Crystal Chill Zone comes recommended by quite a few of the Andheri residents. 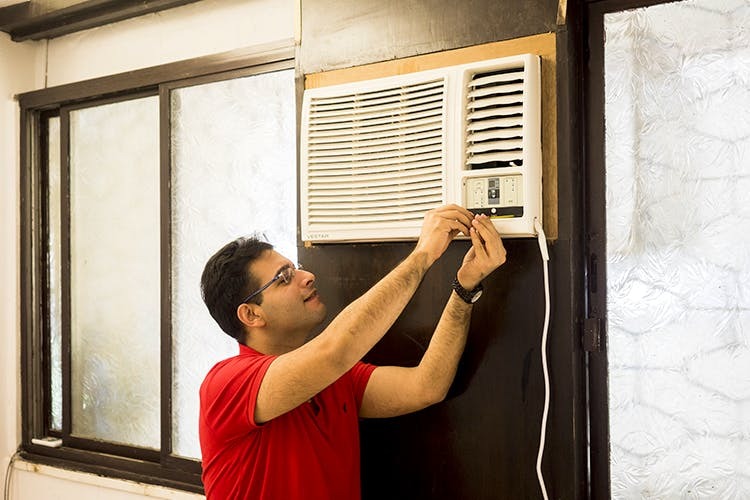 Finding AC on rent in Mumbai is a cakewalk, thanks to them. Give them a heads up at least two days in advance, as they are often busy with their bookings. Though they generally only offer this in Andheri, folks up till Bandra can always call him and ask. Prices, in that case, will vary. They take additional installation and transportation charges. #LBBTip: During the renting period, all repair and maintenance is on them. Price: INR 750 per month (Window 1 tonne AC) and INR 4,500 for six months; INR 6,500 for six months for the split AC. Santan Fernandes is another Bandra chap that comes highly recommended from a loyal customer. Santan tells us he offers the service from Dadar to Dahisar and everything in between. They offer window as well as split ACs, including new and secondhand ones as well. Any damage and repair during the renting period is on him. They charge installation fee of up to INR 500 plus INR 300 for transportation. Additional framing working will be charged as well. The prices vary according to the area. Price: INR 600 per month (window 1 tonne AC), INR 700 per month (split AC). Always make sure to check the condition of the ACs in case of them being secondhand ones. Stay in the room for the AC to cool while the people are setting it up, to make sure the gas in the AC is cooling it off properly.